Taking a cue from seafood ceviches, this dish is very lightly ‘cooked’ by the citrus, but is still for the most part raw. Add any crunchy vegetables available; we often add in cactus paddles (raw or grilled), different chilies, yucca blossoms and other herbs depending on the season. In a medium bowl, toss together the antelope, lime, olive oil and salt. Adjust seasoning. Add the pepper, onion and cucumber and adjust seasoning again. 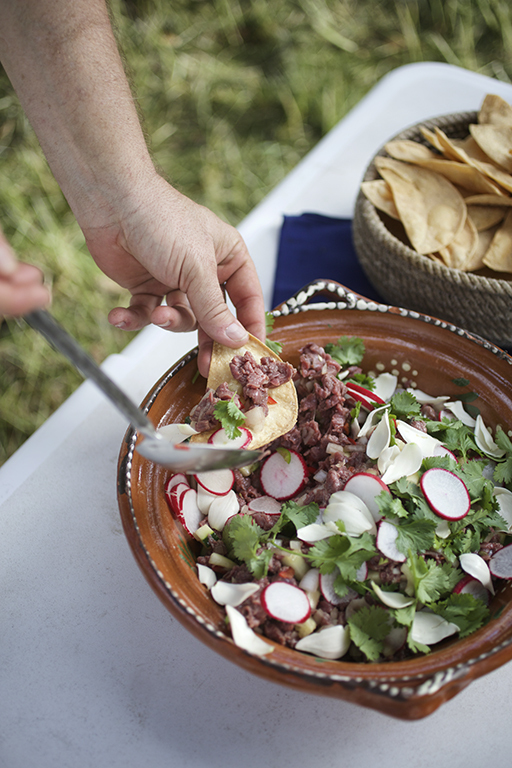 Let stand, refrigerated, for about 10 minutes, then serve, garnished with the cilantro, radishes and tostadas. The sweet, sour and salty flavors of this work very well with grilled game like venison or antelope, as well as the traditional beef. 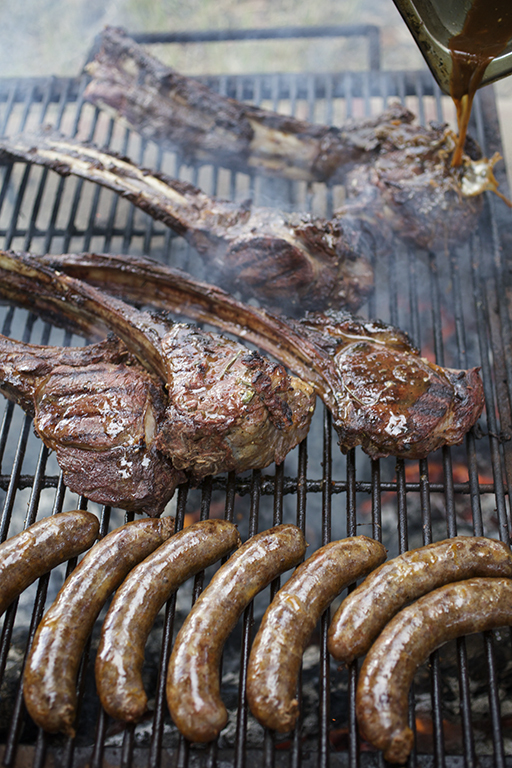 The olive oil helps with both moisture and caramelization on the grill, while the soy gives it a salty boost. If you can, grill the asadas over burning wood or charcoal for the best flavor. We used hearts, chops, skirt steaks and flank steaks for our asada, but any grillable cut or steak would be perfect. Makes about 1 ½ cups, or enough to marinate 3 pounds of meat. Combine all ingredients in a bowl, whisking well to combine. Marinate the cuts intended for use for 24 hours in a non-reactive container, then grill over a very hot fire until charred and crisp and the desired doneness. This spicy Mexican sausage can be stuffed into casings for grilling, but it is almost better left in bulk and browned for taco fillings. Serve the crisped ground sausage in corn tortillas with sliced radish, raw onion, cilantro and salsa, or brown it and scramble eggs into it. It also makes a great addition to beans and soups. Chill a meat grinder in the freezer. Lay the trim out on a baking tray and freeze for about 20 minutes, or until the meats are very cold. Combine the spice mix in a small bowl. Toss the meat and fat with the salt and the spice mix, then grind through the medium plate of the grinder. Gently mix the sausage by hand until homogenous. Refrigerate the sausage for up to 5 days, or freeze for later use. 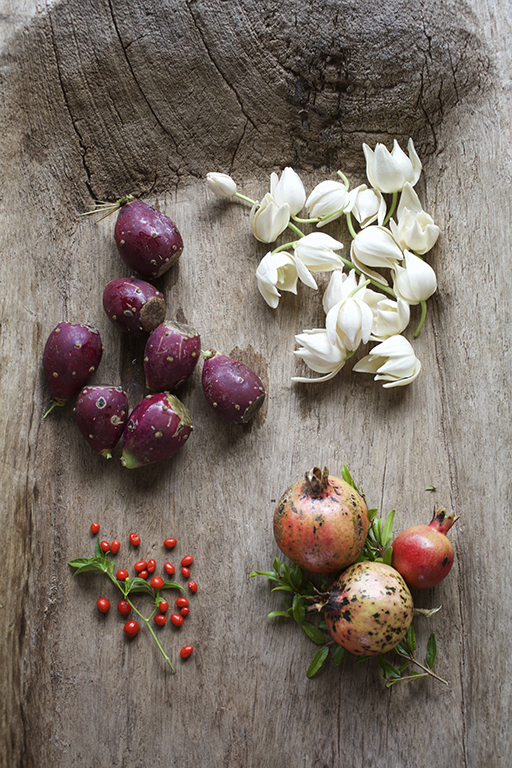 Freshly picked prickly pear cactus fruit, yucca blossoms, pomegranates and fiery chile pequin. Photo by Jody Horton. Carefully pick ripe, red cactus fruit with tongs, and handle them gingerly. The large spines will hurt, the finer spines will annoy. For this margarita, we chose a good mescal, but not an expensive sipper. Tequila would be just fine, too. The chile pequin salt adds a fantastic spice and salt to the drink. Put the fruit, sugar and five cups water in a medium pot and bring to a boil. Simmer for about 20 minutes. Strain the fruit through a fine strainer, gently pushing the fruit to extract as much liquid as possible. There should be about 3 cups of strained liquid. Mix together the prickly pear syrup, lime juice, mescal and Grand Marnier in a pitcher and chill. Using a squeezed lime, rub the rim of each glass, then invert onto the chile pequin salt. Fill all the way with ice cubes and pour over the margarita. Squeeze another half lime into the margarita and enjoy. In a molcahete or mortar, coarsely mash the chilies and salt together. Spread out onto a flat saucer. Store at room temperature for up to 2 days.